I’ll pay for the pizza. Just venmo me! Venmo, the popular mobile payment application in the United States, is surging in usage. The application processed a whopping $4 billion in person-to-person payments in the second quarter of 2016, up by 141% year over year. At LendEDU, our team uses Venmo religiously. Venmo makes splitting bills and paying in groups frictionless. Venmo is so easy, that the app has become a verb for Millennials. Oh just Venmo me later. Can you Venmo for rent? I will Venmo request you. Venmo is designed to allow people to send and receive small amounts of money. Venmo allows users to transfer money to each other in real-time from bank accounts, debit cards, and credit cards. Our favorite feature is the ability for users to withdraw Venmo balances to your bank account via ACH transfer in under a day. And if one of your boys (or girls) forgets to pay what they owe, you can Venmo request that individual for the money without seeming like a complete jerk for asking for $4 for that beer the other day. The best part, Venmo is completely free if you use your bank account and/or debit card. In 2012, Braintree purchased Venmo. Then in 2013, Braintree was acquired by PayPal, who now owns Venmo. Out of sheer curiosity, LendEDU CTO Matt Lenhard thought it would be interesting to collect and analyze Venmo transaction data. Over the last couple months, Matt’s web server has been hard at work collecting and saving over 500,000 public Venmo transactions. Over the last week, the team at LendEDU decided to dig into the data to see what we could find. In short, we found that people use Venmo for just about everything. We found transactions for everything from wine, to strippers, to cocaine, Comcast, and fantasy football. Just about anything you can buy has been paid for on Venmo. Venmo users are usually young and tech savvy. And, Emojis are extremely popular in the app. In our study, we analyzed more than 500,000 transactions to find out which emojis, terms, and categories are the most popular uses for Venmo. We studied a few other interesting things too. Enjoy! Pizza is the clear winner here. The money with wings, and the house emoji, are largely used for rent and bills. 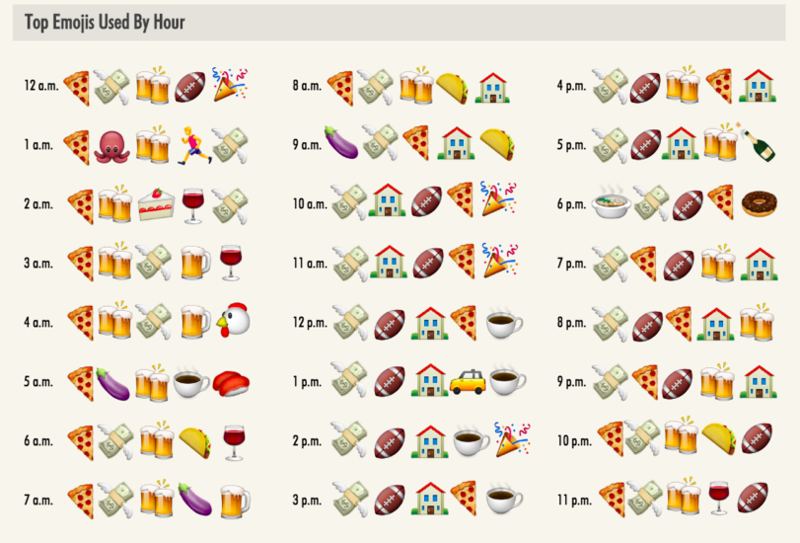 Drinking, eating, and traveling emojis are very popular on the app. Food, Uber, rent, fantasy (football), and bills. Sounds like a normal week to us. Kale was used more than brunch? Obviously Uber was used more than Lyft. We were surprised to see that tequila and strippers broke the top 100…looks like Venmo users know how to party. It was interesting to see that Venmo users are using the app more often for drugs than coffee. 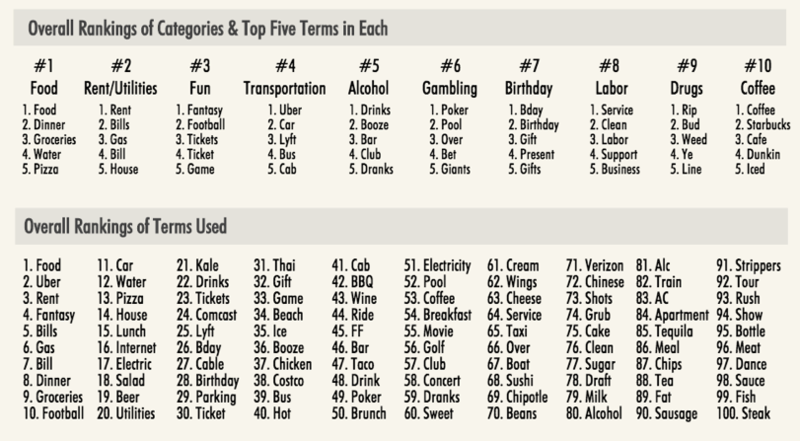 In our Fun category, fantasy and football were the most used terms. This isn’t surprising as thousands of fantasy football players forked over the entry fee for the season. 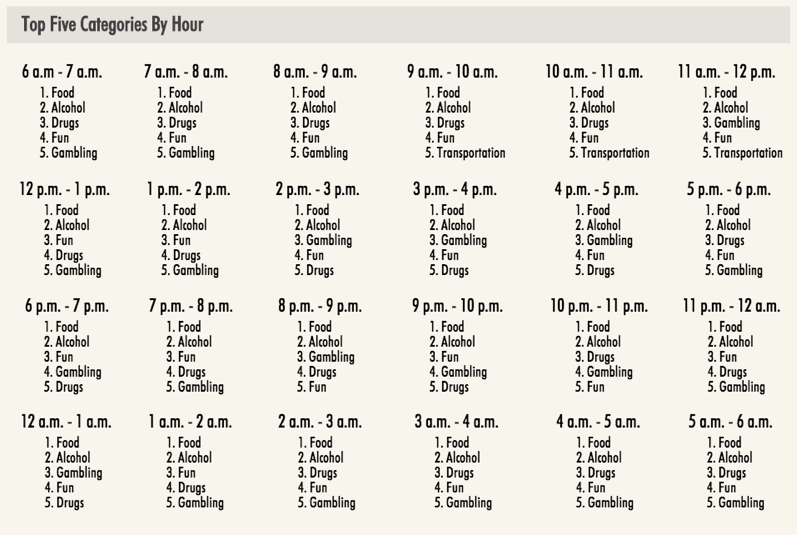 In our own experience, we knew that gambling would be a big category. It looks like there are quite a few users who thought that the Giants would beat the Cowboys in Week 1 (they did). Chipotle on its own beat Chinese. Venmo was more popular during dinner than lunch and breakfast. 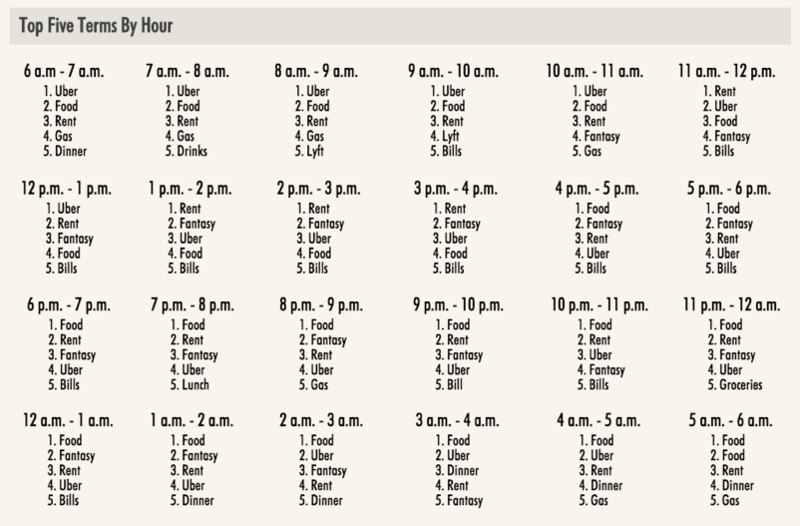 During the week it looks like rent and bills were the most popular use for the app. However, during the weekend pizza and drinking were the most popular uses for Venmo. One user got a little carried away with eggplants, they used the eggplant emoji 500 times in one transaction, which skewed Sunday’s data – an issue that may have also affected other results. Venmo date stamps all of its transactions. We were able to collect the date of each transaction. From there, we were able to match up the date of the transaction with the day of the week of the transaction. Pizza is the king of the early morning. We thought it was interesting that throughout the day people are constantly eating pizza and drinking. In the afternoons, coffee transactions are popular. Starbucks was much more popular than Dunkin’ Donuts. Each Venmo transaction is date and time stamped. We were able to break the results out by time of day using the time stamps provided by Venmo. We were able to collect this data by scraping Venmo transactions. We collected 507,609 transactions from July 22, 2016 to September 15, 2016. How did we determine what categories and terms were used in our study? Obviously, there are more than 10 different categories possible. That said, we needed to limit the number of categories or we would run the risk of making the analysis impossible. In our analysis, we looked for thousands of different terms within the categories that we created. Obviously, we could have used hundreds of thousands of terms in our analysis. But again, too many terms would have taken away our ability to analyze the data. Venmo is leading the way in the mobile payments industry. Venmo has already started allowing users to use Venmo inside of mobile applications. Eventually, we believe that Venmo will become a universally accepted method of payment both online and offline. Venmo’s two founders, computer scientist Iqram Magdon-Ismail and fellow computer scientist turned philosopher Andrew Kortina, met as freshmen in 2001 at the University of Pennsylvania. Within three years, the two started their own company, a classified ad site called My College Post. The company didn’t last long, but the two entrepreneurs decided to share an apartment in Philadelphia where they freelanced on website design. They developed a music site, Philafunk, and a website analytics tool called Swooge. They also went to work for a game studio called OMGPop. Thereafter, Magdon-Ismail worked for a company called Ticketleap while Kortina was employed at Bit.ly. After several years, they decided to partner on their next venture. In 2009, the pair launched Venmo, initially as a text-message site that allowed mp3 files to be exchanged. They picked the site’s name to represent mobile selling, and because the website name was cheap to buy. The site was soon revamped when Magdon-Ismail visited Kortina in New York City but forgot his wallet. Kortina lent Magdon-Ismail money, and was repaid with a check. Brainstorming over the relative inefficiency of checks, they redeveloped Venmo to send and receive payments between account holders via the mobile phone app. In 2012, the payments company Braintree shelled out $26.2 million to buy Venmo. When Braintree originally owned the company, Venmo was processing a monthly payment volume of about $10 million. Volume was growing at an incredible 30 percent per month, and was expected to reach $250 million annually by the end of 2012. Chicago-based Braintree was founded in 2007 as a credit card payments processor, and had acquired more than 3,000 e-commerce clients, including Uber and Airbnb. By 2012, Braintree had become a powerhouse payment gateway offering merchant account processing, credit card storage, recurring billing, support for international and mobile payments, and PCI compliance solutions. Braintree integrated Venmo’s software into its own, but allowed the Venmo 23-person staff to maintain its separate identity in New York. Braintree’s idea was to allow Venmo users to make purchases from select merchandisers using the mobile app. In 2013, the PayPal unit of eBay acquired Braintree for $800 million in cash. At that time, PayPal provided 40 percent of eBay’s revenue. By getting Braintree’s Venmo app, PayPal now owned access to a working, dependable platform for making payments simply as well as a social user interface – when a Venmo user transacts, the details (minus amount) are shared on the user’s news feed and friend network, if the user permits. For its part, Braintree benefited from eBay’s valuable data security experience and a mature corporate infrastructure. Its main competitors were Stripe and Balanced. In July 2015, eBay spun off PayPal (which included Braintree and Venmo) into its own company by distributing one share of PayPal common stock per eBay share. The value of the spinoff was put at $47 billion. Thus, PayPal owns Braintree and Venmo. For the third quarter of 2016, Venmo processed $4.9 billion of total payment volume, up 131 percent from a year earlier.